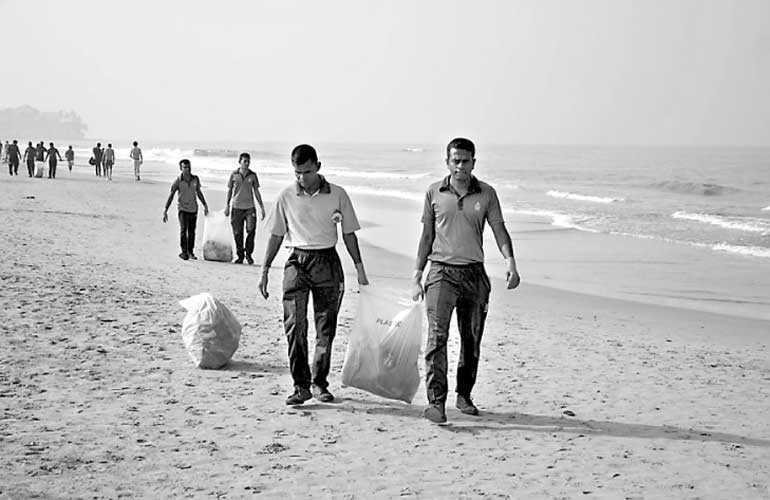 Women’s International Shipping and Trading Association (WISTA) Sri Lanka organised its first ever coastal clean-up initiative on 26 January from Dehiwala to Mount Lavinia spanning over 2 km of coastal line. This event signified the importance WISTA places in its endeavour to protect the deep sea and coastal line in accordance with the Association’s mandate on leading strategic CSR initiatives. Amongst the Associations, companies and environmental conscious enthusiasts who volunteered and partnered WISTA in this initiative, Dr. Sevvandi Jayakody, Senior Lecturer of the Wayamba University whose research interest is on understanding the impacts of human disturbances to aquatic environments with special reference to animal behaviour, water quality and species occupancy, evaluating the effectiveness of environmental policies and management plans in marine and fresh water ecosystems, graced the occasion as the Chief Guest. The Waste Management Authority and the Sri Lanka Navy rendered their fullest support to WISTA which went a long way in creating an effective and successful campaign. The event was also graced by officials from the Sri Lanka Navy, Waste Management Authority and South Asia Gateway Terminals (SAGT) co-operate partner of WISTA Sri Lanka, with many volunteers from the Shipping and Trading Industries and environmental conscious individuals who joined hands in being part of this timely initiative by WISTA. All participants gathered by 7 a.m. from the entry point at Sri Dharmapala Mawatha and progressed towards both Dehiwala and Mt. Lavinia coastal belt cleaning up debris and making everyone conscious of the great pollution that’s affecting our beautiful coastal line. Members of the WISTA team took great strides in creating a much-needed awareness in the industry and taking a lead role in addressing the need to create strategic CSR projects. The waste collected was segregated as plastic/pet bottles, glass, paper and mixed garbage which was sent to the local authorities re-cycling plants; a total of 200 bags of segregated garbage was collected by volunteers using 100% bio-degradable garbage bags which was another first for WISTA. WISTA aims to continue its endeavour to be a voice in protecting our coastal line and the marine life and hope to carry out many such projects in the future as it firmly believes in giving back to the environment. WISTA has been successful over the years in breaking down gender barriers within the Shipping and Logistics Industry by encouraging more women to join and build career paths.